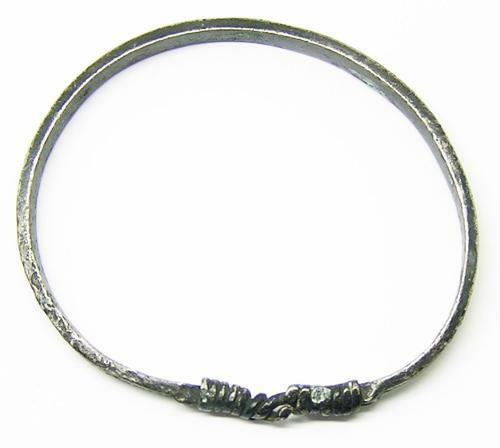 This is an ancient Scandinavian silver bracelet, dating to the 9th - 11th century A.D. The ring is formed from a rod of silver, hammered to form a flat band, tapering towards the terminals that thin-out to become a wire with the ends joined in a slip-knot. The outside of the bracelet is decorated with a punched linear pattern, forming a lozenge panel in the centre. This type of bracelet was popular throughout the Scandinavian Iron-Age, being found in treasure hoards and as single losses. This example is in excellent condition, intact and uncleaned, with the original dark patina from the excavation.